2017 is here, which means it’s time for our annual news and notes. This post will recap our highlights from 2016 as well as let you know what you can expect from HRAF in this new year. Don’t forget that we are always happy to hear from you with any feedback and suggestions. As a small, membership-based non-profit, we enjoy working closely with researchers, librarians, faculty and students while developing and improving our products and services. 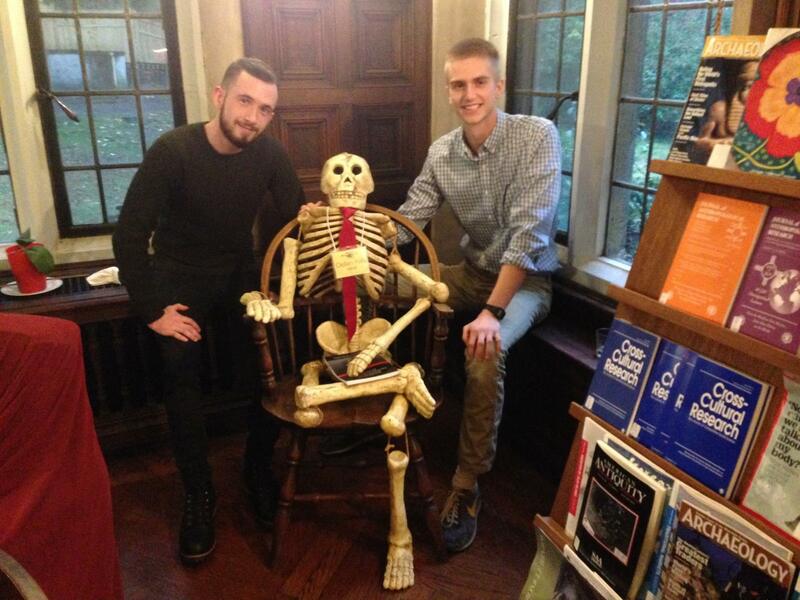 New interns Erik (left) and Jack (right) pose with a figure from HRAF’s past. The first, Explaining Human Culture, is a publicly accessible database containing information on over 800 cross-cultural studies spanning more than 100 years. The second, Introducing Cross-Cultural Research, is a visual online course on the fundamentals of cross-cultural research. View this post for more information. These welcome additions to the HRAF suite of products are freely accessible and open access, and make excellent companions to our other cross-cultural resources for research and teaching. Another highlight from 2016 has been our collaboration with D-PLACE, the Database of Places, Language, Culture, and Environment. Each culture page in D-PLACE for the societies that are included in eHRAF contains direct links into our eHRAF World Cultures database, so you can easily find your way to eHRAF while browsing D-PLACE. Learn more about this here. Our flagship (membership-based) eHRAF databases saw a host of improvements as well. As part of our members-first focus that we intensified throughout 2016, we have dedicated a lot of time to making eHRAF work for you. At the heart of this commitment has been our updated and more thorough customer support options. Most significantly, Christiane Cunnar, HRAF member services, began offering regularly scheduled live webinars as well as customized sessions for bespoke customer support. Our status as a small and personal non-profit enables us to provide a level of one-on-one customer care that we can be proud of. The interactive video webinars are tailored to the needs of librarians, teaching faculty, researchers or students and are always free to join. In addition, our enhanced eHRAF user guides became available within the eHRAF interface in early 2016. These guides take you step-by-step through each page and feature of the databases. They’ll be updated as new features are added, for quick reference whenever you need help navigating, browsing, searching, citing or saving your results. They can also be printed or shared for classroom use. Have you learned anything new so far in this post? Then you’ll definitely enjoy our HRAF promotional videos. You can find our latest productions on YouTube, including an Introduction to HRAF and one for Explaining Human Culture. Librarians and faculty might also be interested in the colorful and informative promotional flyers, banners and brochures that we produced this year. We’ll be adding these to our homepage shortly and, if you’re on our mailing list, you’ll receive more information soon. One request we often receive from members is for more information about how we are growing our culture collections in eHRAF. You’re curious about which new cultures are being added into the databases, but also when we expect to get all of our cultures that were once in microfiche into our digital collections. Here’s a brief summary of what cultures and traditions we have added in the past year and what we expect to include in 2017. Also anticipated for 2017 is the addition of Ethnographic Atlas case matches in eHRAF searches, similar to the SCCS case matches feature that we added in 2015. What is rarely known is that the vast majority of our production process happens in-house right here in our building. With our small, dedicated team of analysts and IT staff, we are constantly working to update our production process; that is, the steps we take to collect, sort, index and make available as much rich, cultural data as we can for our users. Although the HRAF files are no longer distributed on paper because we have digitized our eHRAF collections, we’re still working towards a totally digital workflow. Trying to make that last step from paper to a wholly digital production process is an ongoing challenge and our IT and Production teams are developing ways to get everything digital at every stage. We’ve come a long way since 1949! In addition to more cultures being added to our databases, we have exciting new developments in the pipeline for the eHRAF World Cultures and Archaeology databases in 2017. Most notably, stay tuned for further announcements this year for a much-anticipated feature in eHRAF that will allow researchers to collect, save, and organize paragraphs and snippets from search results. To accompany all of our products, we’ve been steadily improving the contents of our homepage, including streamlining our information pages (see Reference Materials) and featuring posts by HRAF’s anthropologists highlighting our latest research projects. 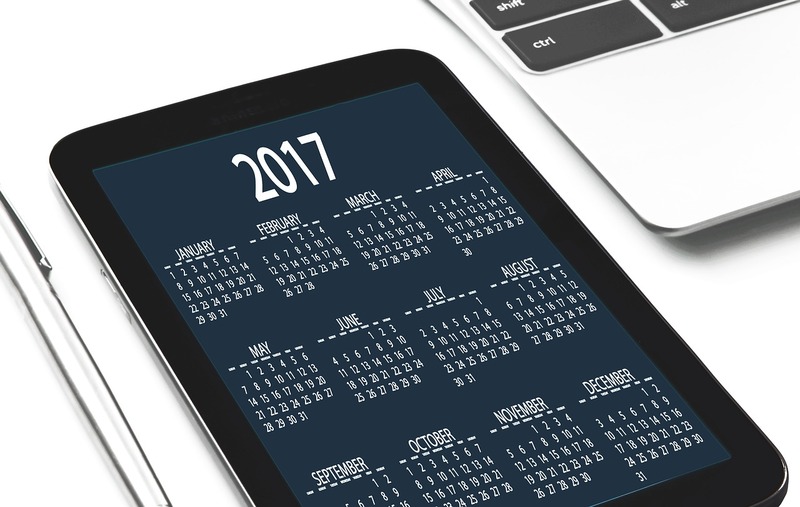 We plan on having more of these features in 2017 and also welcome guest posts from our members on topics of cross-cultural or anthropological interest that feature HRAF topics or databases. If you have eHRAF or Explaining Human Culture-based research to share with us, including class assignments, drop us a line at hraf@yale.edu. We’ll also be announcing more exciting ways for HRAF members or fans of our databases to contribute to eHRAF. Keep an eye on our blog for more information coming soon, but here’s a heads-up: if you have fieldwork or cultural travel experience and/or use the eHRAF databases for teaching and coursework, you may be able to join in and even become a featured contributor. Anthropologists with photographic experience will receive a special invitation to participate soon. Looking ahead to the rest of the year, we plan to produce more HRAF multimedia including a revised set of how-to videos to accompany our eHRAF user guides; additional teaching exercises in Teaching eHRAF; and new modules and accompanying teaching materials for Explaining Human Culture. As always, we look forward to hearing what you’d like to see from HRAF in the future. Thank you again to our members for your support and Happy 2017.